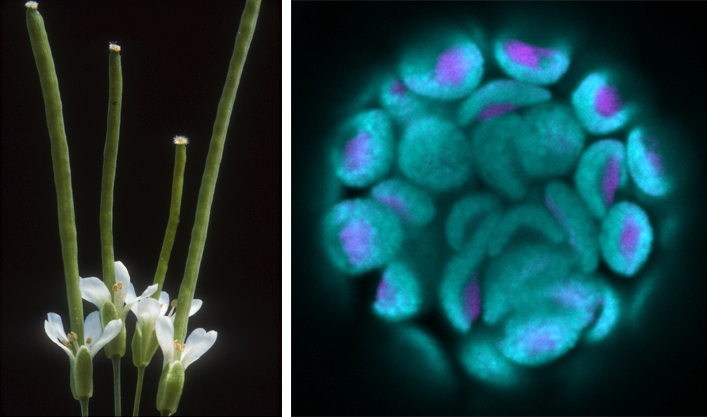 We are interested in the molecular and cellular basis of developmental transitions in plants. In past projects, we investigated the role of MADS domain factors in regulation of flowering time, floral organ abscission, and pollen growth and development. In current projects, we are investigating protein sorting during plastid biogenesis. Plastids are transformed from relatively undifferentiated proplastids into a variety of differentiated forms (chloroplasts, chromoplasts, amyloplasts, etc.) through changes in protein composition and membrane organization. This is mediated by targeting and translocation systems that ensure the proteins are directed to the right place at the right time. For information on specific projects both past and present, click the “projects” tab.